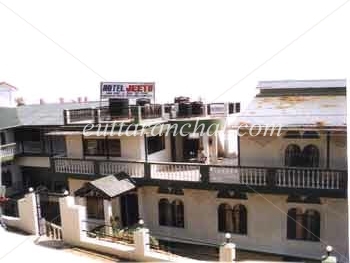 Hotel Jeetu Inn is strategically located at the top of the Kausani hill, offering aweinspiring vistas of nature. A very wide range of Himalayan range is distinctly visible from Jeetu Inn. The view of sunrise and sunset are invigorating from Hotel Jeetu. It is a budget hotel in Kausani meeting the standards of standard hotels. Hotel Jeetu houses a multi-cuisine restaurant offering Indian and continental food. The hotel offers warm hospitality and basic amenities ensuring comfort to the guests. Hotel Jeetu gives you a panoramic view of majestic Himalayas. The Himalayan range across 340 km. is visible from the Hotel. The Major peaks of Chaukhamba, Neelkanth, Nanda Ghunti, Trishul Devsthal, Nanda Devi East and West, Nanda Kote, Pindari Glacier, Nanda Khat, Panchachuli and few peaks of Nepal can be seen. Jeetu Inn is located at walking distance from Anasakti Ashram of Mahatma Gandhi. It is located 3 kms from tea gardens and 5 kms from Pinnath Temple. Baijnath temple is 18 Kms from Hotel Jeetu. There are 22 rooms in Hotel Jeetu, categorized as Semi-Deluxe, Deluxe, Super Deluxe Premium and Family Suites. The rooms have aesthetically done interiors with a double bed, sitting area and attached sanitized bathrooms. The rooms of the hotel are affordably priced so as to meet the needs of discerning travelers. Hotel Jeetu houses a multi-cuisine restaurant which serves delicious food with good service. The restaurant serves Indian and continental delicacies. - All room with attached Bath & Shower, Running Hot & Cold water, Cable T. V.
- Welcome drink on arrival ( Soft beverages ), Fruit Basket in the room on arrival, Morning tea, Breakfast and Dinner on Menu Plan.